Do You Know the Way to Nearest Pyramid? Flying during the day has its advantages. Looking out the window I knew the Gulf Air pilot was going the right direction because there were several very visible landmarks. 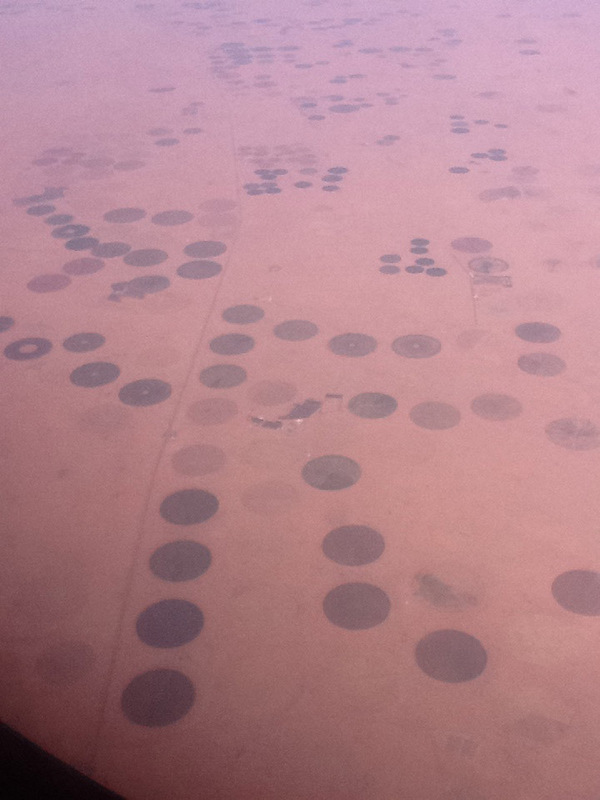 North of Riyadh were the crop circles. When I was growing up in Saudi Arabia I never really questioned where they grew the fresh alfalfa we fed to our Arabian horses. It was so green, it had to be dried in the sun before the horses could eat it. The Saudis grow wheat and alfalfa using water from ancient water reserves created during the Pleistocene era – after the dinosaurs but just as homo erectus started wandering around. It was quite amazing to see this green in the desert. Obviously the water will not last forever. My father used to be involved in figuring out ways to bring water to the desert. During a family dinner he told us about an idea to tote an iceberg from Antarctica. That was never done. 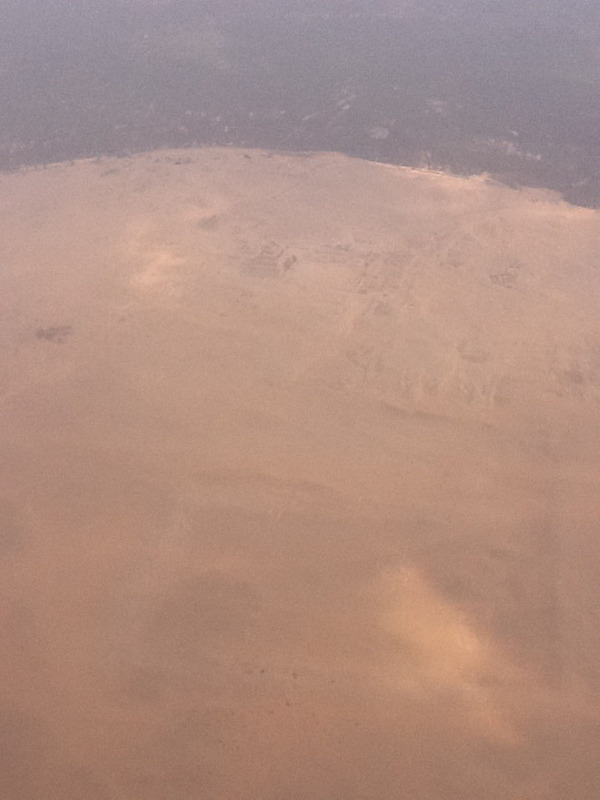 As we turned west we flew over the Sarawat Mountains. These look like mini volcanoes with something hiding in the center. 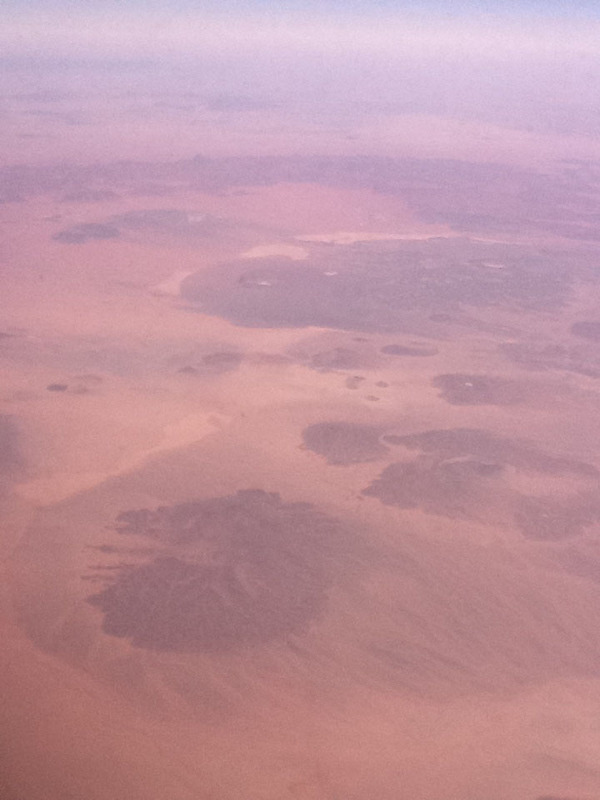 I think it was sand but maybe inside are secret UFO landing sites. Supposedly millions saw UFOs over Riyadh in 2009. 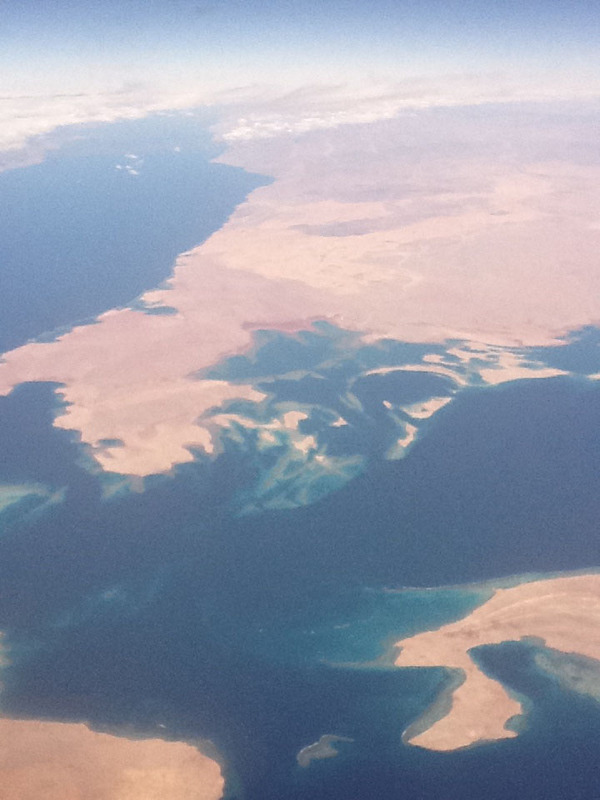 The Red Sea looked extremely blue next to the brown desert. 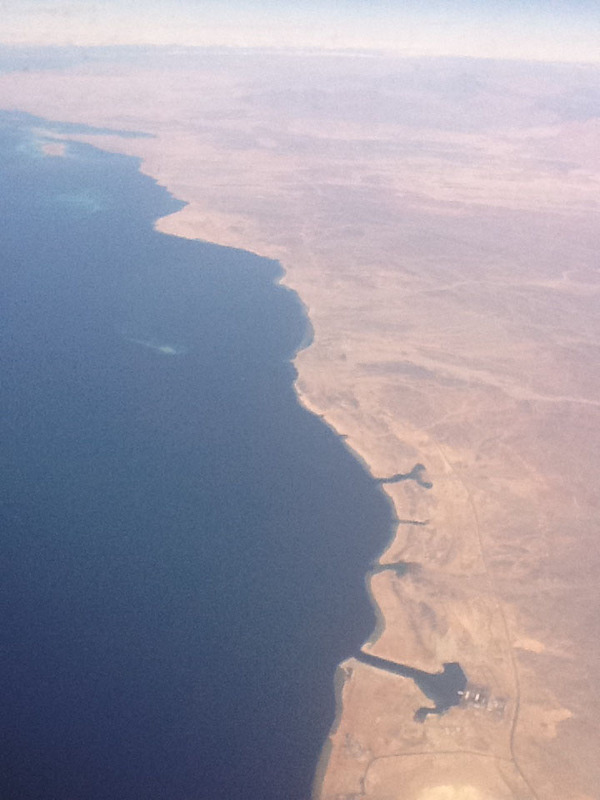 I enjoyed how the land and the sea intertwined creating a beautiful view that can only be seen from above. Over Egypt the Nile’s water keeps the desert at bay. The human settlements are only within the areas the water reaches. 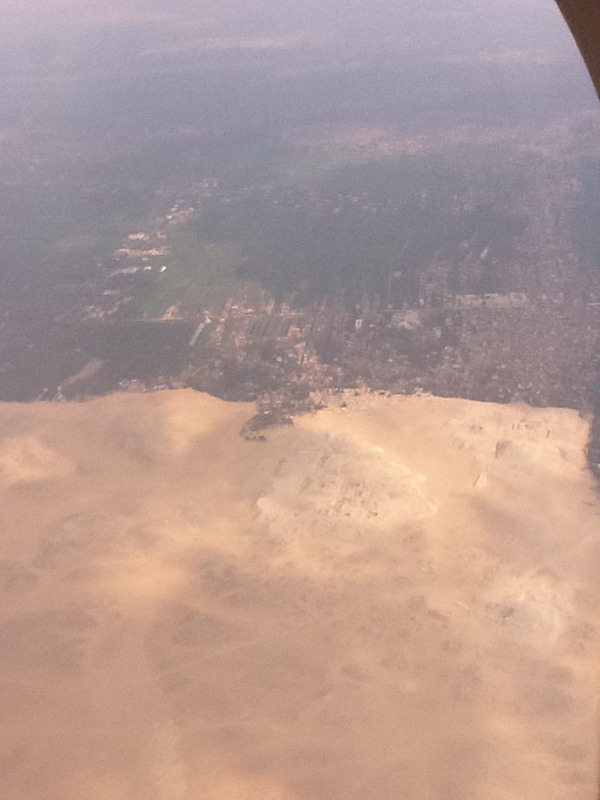 Outside of Cairo we flew over the oldest pyramid in Egypt – the Djoser at Saqqara. It is a step pyramid built around 2,700 BC about 300 years after the stone pyramid in Peru. Imhotep the founder of medicine was the architect who designed the pyramid. In artwork he was associated with the Goddess Hathor. Click on the photo to enlarge it. The pyramid is at the top of the photo. All the photos were taken with my Ipad. I will start using a better camera soon but I can only learn so much technology at a time. Couldn’t quite see the pyramid but I believe you that it’s there. 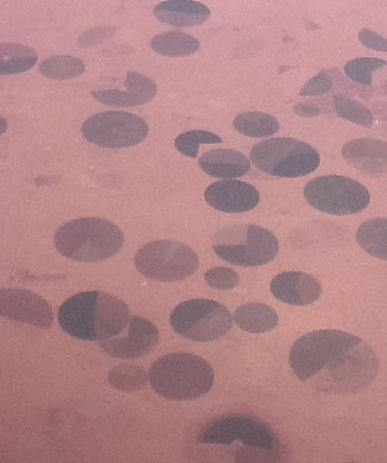 Photos of desert v. sea and desert v. irrigated land confirm that a picture really is worth a 1000 words. On the last photo, click on it so a larger image comes up. It’s about a third of the way down from the top of the photo in the center. Obviously in the desert. I’ve never been out there but it’s a large complex. Amazing how it can be seen from the air.